Is "get organized" on your list of New Year's resolutions? 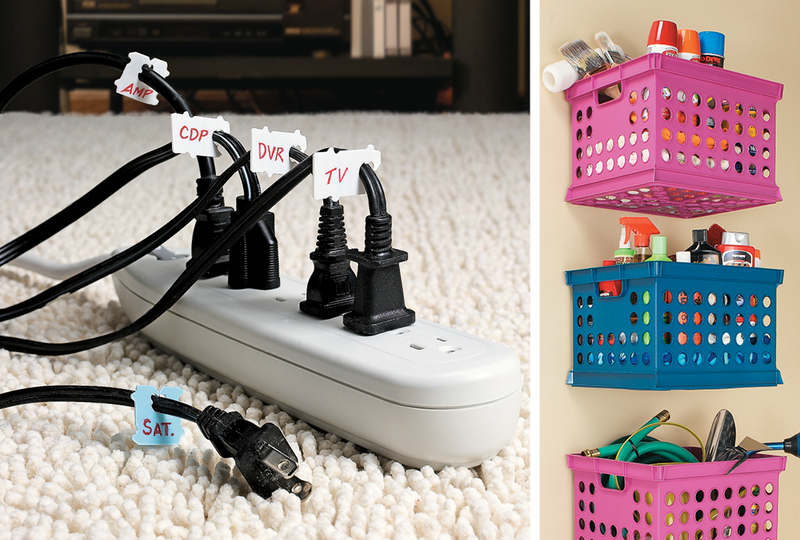 Even if it's something as simple as labeling power cords with bread bag tags, these easy-to-implement ideas will help eliminate everyday frustrations and make your home as orderly as could be. Milk crates (above right) have proven their worth as a portable storage option. Hanging them from L-hooks screwed into wall anchors lets you create a functional display, and they lift right off the hooks when you're on the go. For smaller items, purchase magnetic bins and stick them to a sheet of galvanized metal mounted on your wall (below left). If you're more inclined to stash stuff where no one can see it — say, under a bed or in the back of a deep cabinet — consider adding pull-out drawers in places that usually don't have such a thing. This can be done by painting existing drawers (or boxes of any sort), attaching casters, and slipping them into places where you need stylish storage. You can also purchase bottom-mounted baskets that pull out for easy access, like this one from Rev-A-Shelf. Installing shelving is nothing new ... the challenge comes when you simply don't have enough space. Add shelves in "dead spaces" — like above a window or above your washer and dryer — to give yourself an extra surface for display and storage. Incorporate unexpected organizers on open shelves, too. In an entryway, for example, a row of mailboxes is easy on the eyes and corrals everything from mittens to magazines. Mounting rods horizontally to a wall or piece of furniture for the sake of hanging items is another great way to organize all sorts of spaces. Sturdy canvas tool totes are apt for utilitarian areas. In the kitchen, you can simply hang utensils and essentials from S-hooks. And in a craft area, rolls of ribbon easily slide onto a thin rod or dowel. These ideas not only keep items close at hand, but they serve as decoration, as well. Get to it! You'll have that New Year's resolution accomplished before you're even in the habit of dating things "/14."